Providing you the best range of auger filler spices packing machines with effective & timely delivery. 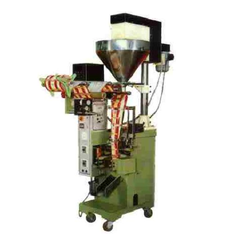 We are actively engaged in manufacturing and supplying an excellent range of Auger Filler Spices Packing Machines. Our offered packing machines are designed using the best quality components and modern technology in adherence with industry norms. Apart from this, our quality examiners stringently test these packing machines on different quality parameters so as to maintain their quality. Our prestigious clients can avail these packing machines from us at industry leading prices.